Good Boy Pawsley & Co Bite Size Bites (Duck) are perfect for rewarding good behaviour or just to show your dog how much you love them! 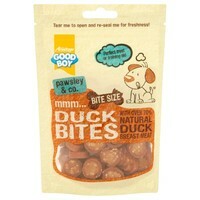 Made with 75% real duck, these tasty treats are packed full of flavour and irresistible to dogs. Treat your dog to something they'll love, which is also good for them! A great complement to a well-balanced diet.